Barrier Gate controller -- variable frequency type, is the enhanced barrier control which speed can be adjusted . 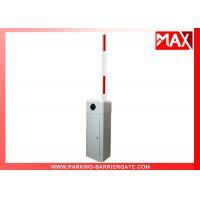 3.2.Open the barrier gate by motor wheel when power off and automatic locking when power on. 3.3.Balance boom running with a motor transmission of cranks and shafts. 3.4.Remote control to operate the barrier gate. 3.5.Auto-reverse when the boom meets obstruction. 3.6.Infrared photocells connector is available. 3.7.Loop detector connector is available. 3.8.Well-intergrated with car parking system equipment,with wire control(must be switch signal). 4. OEM: we can customized machine case, color, logo for you, which accroding to your detailed requirements. 5. Technical support and aftersales service, it is a long term relatioship between us. 6. Price can be negotiable when you have big order quantity. 4. Overdue service items are out of our promise. A: We are a professional barrier gate manufacturer. A: Generally it is 2-5 days if the goods are in stock. or it is 5-7 days if the goods are not in stock, it is according to quantity. We can send it for you by DHL/Fedex/TNT/SEA/AIR or your requirments. Q: How about payment terms our company provide? A: T/T or Western Union. A:No,we don't provide samples. The MOQ of our products is 1pc.